Visions of Jesus Christ.com - Medjugorje model had vision of St. Pio - Polish model Ania Golędzinowska lived a life of celebrity, substance abuse, and hostility toward the Catholic Church. One night a mysterious stranger came to admonish her. Only in Medjugorje did she recognize him as Saint Pio. “It was only five months ago in Medjugorje that somebody gave me a book about the life of Padre Pio, and for the first time, after eight years, I could give the name of the person who eight years ago came to admonish me." Sept 12, 1012 Reported in [Spirit Daily.com]. Before her conversion in Medjugorje, the Polish model Ania Golędzinowska lived a life of celebrity, substance abuse, and hostility toward the Catholic Church. One night a mysterious stranger came to admonish her. Only in Medjugorje did she recognize him as Saint Pio. Eight years ago Polish model Ania Golędzinowska woke up in the middle of the night in her Italian home to find a mysterious man standing by the side of her bed, shaking his head at her in disappointment.It was only years later when she moved to Medjugorje in 2011 and was given a book about Saint Padre Pio that Golędzinowska recognized the man’s face. When she experienced the mysterious encounter, Golędzinowska was leading a far from virtuous life.Though a successful model, an actress in Italian sitcoms, and a TV presenter, she admits to struggling with substance abuse, lacking faith in God, and even developing a strong resentment toward the Catholic Church. 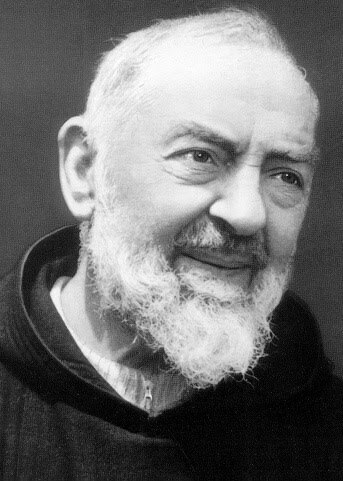 Saint Pio, she believes, came to warn her to change her ways. The former model recalls the day when she finally identified him: “For years, I did not know who he was. Even in my book I reported this incident but did not include the man’s name” Ania Golędzinowska told Brother Marcin Radomski in an [interview] she gave earlier this year in Łomża, Poland. This is the first time this part of her story is being told in English. “It was only five months ago in Medjugorje that somebody gave me a book about the life of Padre Pio, and for the first time, after eight years, I could give the name of the person who eight years ago came to admonish me, to warn me that if I would continue leading my life this way then I would not go far.” Golędzinowska was very open about how far away she strayed from the Church in those years, to the point of developing a hatred for all things Catholic. “I was far from the Church. If I would get a chance, I would shoot all priests and nuns. Whenever I saw a church, I would cross to the other side of the street. I abused drugs. I drank.” Then one night a warning came. Even her dog, Golędzinowska recalls, sensed the presence of a stranger in the room, suggesting to her that this was no hallucination. Though Golędzinowska believes Saint Pio came to her with an important message, he did not need words to convey it. “He did not say anything, but he was looking at me as if he wanted to say: ‘Ania, what are you doing?’” Ania Golędzinowska made much news last year when [Catholic Herald] published a popular interview with her. 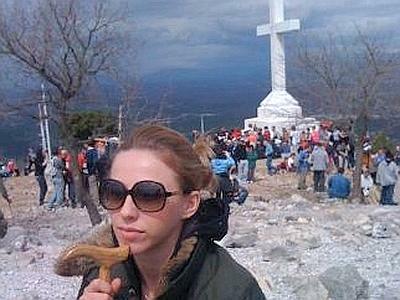 The interview centered around her life-changing conversion in Medjugorje and its consequences. She made the decision to leave the life of glamour and fame in high Italian society behind for a simple, peasant life of prayer and service in Medjugorje, where she has been living since 2011 with Pure Hearts, a Marian community of priests and nuns. For the Polish model, this required ending a prominent relationship with her boyfriend Paolo Enrico Beretta, the nephew of then Italian Prime Minister Silvio Berlusconi. Lately, Golędzinowska has spent much time touring Poland, as a Polish edition of her autobiography was recently released, translated by a priest. Her book, Ocalona z Piekła: Wyznania byłej Modelki translates to “Rescued from Hell: Confessions of a former Model.” A section in the book describes Golędzinowska’s encounter with the visitor who appeared to her in the middle of the night years ago to give her a helpful warning. Now readers may know that Ania Golędzinowska has identified the mysterious visitor as Saint Pio of Pietrelcina.